You probably don’t think of Stephansdom cathedral when you think of 20th-century modern art. Maybe you should, though. 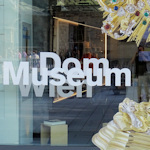 The Dom Museum, which is part of the Archdiocese of Vienna and home to many cathedral’s treasures, manages the trick of combining historical riches with abstract and avant-garde pieces from modern Austria. If you’re expecting dusty shelves with cathedral statues worn down by too many Viennese winters, then you’d be mistaken. Otto Mauer, a priest, was a driving force in promoting modern art and artists in the post-WWII period, running a gallery close to Stephansdom and accumulating a collection now owned by the Dom Museum. In the room dedicated to this collection, you can see works by renowned contemporary Austrian artists, including a black chalk sketch by Gustav Klimt (“Old man”). The influence of modern thinking creeps into the more traditional Cathedral collection, too. You can sense it in the organisation under themes like “celebrate” or “follow”. Or in the occasional mix of old and new, like when a 2017 abstract graphite drawing provides the backdrop to a 1630 silver and gold monstrance. The gilded, enamelled glass bottles from Syria, dating back to around 1300. Gorgeous. At the time of writing, the museum opens Wednesday to Sunday, from 10 am, closing at 6 pm (8 pm on Thursdays). Entrance costs €8 for an adult, with concessions available, or is free with the Vienna Pass. There are just a handful of rooms in the museum, so it doesn’t take long to get around. I was in for an hour and that included taking notes and watching bits and pieces of the videos. See the main Stephansdom article for travel tips. The Dom Museum is actually outside the cathedral, along the row of shops opposite the north tower. If you stand before the main entrance to the cathedral, go round to the left and keep going. You should see the museum on your left, next to the ramps leading down into an underground garage.